Game Information: Being one of the leading software developers in the iGaming world, Microgaming continues to full out all the stops when it comes to introducing exciting and innovative new games. 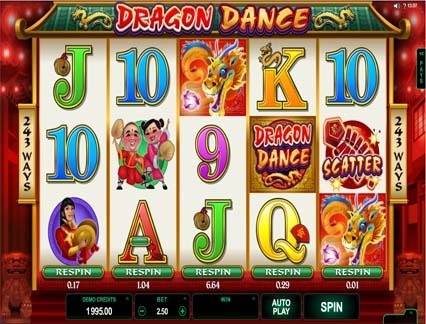 Dragon Dance is something we have seen before, but thanks to a bright and beautiful theme and Microgaming trademark high-quality graphics, sound and gameplay, you can expect a thrilling experience on the reels playing this popular online pokie. Dragon Dance is a 5 reel and 243 ways to win game. It takes its theme from the Chinese New Year, a festival that is celebrated with dancing dragons, drummers, music and lots of excitement. This is all evident in the game, complete with bright graphics and festive background music to really set the scene. In addition to striking visuals and sound effects, the game also boasts some incredible features to boost your bankroll. There is a respins feature that allows you to choose to respin a reel for as many times as you like, until a winning combination is formed. In addition, the main feature is the lucrative free spins bonus, where you earn 15 free spins upon activation and the chance to win even more and all wins are trebled too. 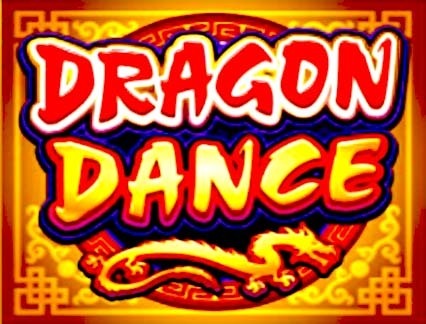 Dragon Dance is a 5 reel and 3 row with 243 ways to win online pokie game. Because of this structure, there is no need for usual paylines, which is replaced by a system where you create winning combinations on adjacent reels from left to right. All the action takes place underneath a temple roof with Chinese lanterns floating against a red sky in the distance. There are 5 high-value symbols on the reels that are related to the theme of the game, including a dragon mask, dragon costume, drummer and girl, and two dancers. The 9, 10, J, Q, K and A represent the lower valued symbols. The wild is represented by the game’s logo and replaces all other symbols on the reels except the Chinese cracker scatter symbol. 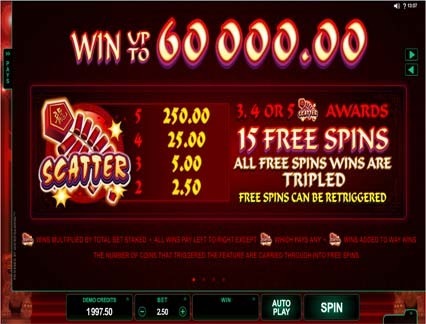 That said, the scatter is the trigger to the main free spins bonus feature. Free Spins – As mentioned above, the free spins is triggered by landing three or more scatter symbols on the reels. Once triggered, you will earn a cool 15 free spins where all your spins are tripled. But that’s not all the free spins you can earn. This feature can be retriggered whenever you land even more scatter symbols on the reels. Respin feature – Here, players have the chance to respin any reel once following a spin. This respin costs an additional bet which is equivalent to the value of the win. Join the celebrations of the Chinese New Year with Dragon Dance. The graphics and sound effects all contribute to the festivities, making the game a sensory delight in addition to a rewarding experience. As expected, the game has an Oriental feel where players are welcome to enjoy the celebrations with fireworks, dramatic artists, drummers, and of course, dancing dragons. The colour scheme is brightly coloured with red being the predominate colour, which signifies bad luck in the Chinese tradition. Other colours present include gold, green, purple and bright blue, adding to the festival theme. The sound effects compliment the game well, creating an atmospheric vibe that is reminiscent of the actual festivities. Dragon Dance is not a progressive jackpot pokie, although there is a decent main prize of 160x your bet. The game is considered to be a medium volatility game, which means it pays out fairly regularly although not as much as low variance games and a lower amount than other progressive or high volatility games. When it comes to special features, Dragon Dance is most well known for its two bonus features, which have been mentioned as being the free spins feature and respins. The free spins is triggered when you land three or more scatter symbols on the reels, which awards 15 free spins right off the bat plus your wins are trebled. What’s more, this feature can be retriggered, which means more free spins are up for grabs. The respin feature comes at an extra cost but allows you to get a second chance to win big, with a bet amount equivalent to the amount you are playing for. This game is packed with some exciting opportunities to win big, plus it features a generous jackpot of 160x your bet.